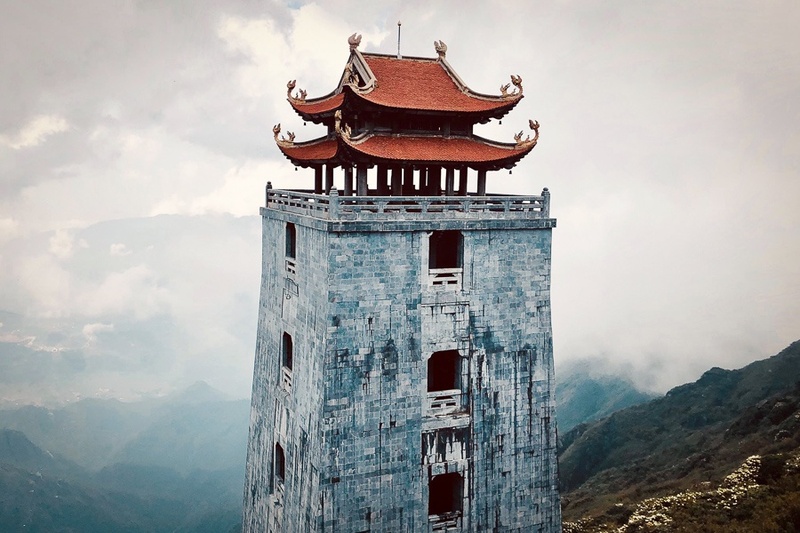 Fansipan (aka Phan Xi Pang) is the tallest mountain in Vietnam, and also the tallest mountain in the Indochina peninsula (Vietnam, Laos and Cambodia). It’s over 10,000 feet tall, so you’ll need to ride a cable car or do some trekking to reach the top, but the views from up there are amazing. This page will explain how you can do it on your own, without a tour, and with a very modest budget and minimal planning. Read on! Bring a coat, because it gets a little chilly on top of Fansipan. First of all, if you’re on a tight schedule and want to skip the extra steps involved in arranging your own trip to Fansipan, there are some companies that offer prearranged day tours to the mountain via cable car. If you’d rather hike it, there are also a number of companies offering 2 or 3-day trekking tours to the top of Fansipan. Step #1. Reach Sapa. Road travel is currently the only way to get to Sapa from Hanoi. I recommend going by bus, because this is the safest and cheapest way to get there. The bus company I went with was Sapa Express and I had a good experience on both trips. Step #2. Reach The Fansipan Cable Car Station. There are a number of ways to get to the cable car station, but I recommend taking the train. This is arguably the most scenic route and also pretty cheap. The train departs from MGallery Hotel in the Sapa city center, and the price for a return ticket is 200,000 VND ($8.50 USD). If you don’t want to take the train, your other option to reach the cable car station is to take a taxi. Step #3. Buy Cable Car Tickets. The ticket price is 600,000 VND ($25.80) for adults and 400,000 VND ($17.19) for kids. There is no need to get your tickets in advance, because they’re only valid for the day you buy them. However, if you buy them as a train + cable car bundle at the train station (in step #2) then it will reduce the price by 50,000 VND; this is a good idea. Step #4. Ride The Cable Car. The cable car takes about 20 minutes to reach the top, and the views on the way up are absolutely incredible. It was designed by Bill Hensley and holds a Guinness World Record for being the longest three-rope cable system in the world. The cable car views on the way up the mountain are incredible. Step #5. Enjoy The Summit! From the plaza where the cable car lands, it’s a short 15 minute walk up to the top of the peak. You’ll want to bring a coat, because there is a noticeable temperature difference compared to Sapa town. The Fansipan summit gets a bit chilly even in the summer. I brought a light hoodie, and this was good enough in May. Sadly on the day I visited Fansipan there was too much fog at the top to see the mountains clearly, but it was still a really cool experience because the heavy mist made the pagodas and everything else up there look surreal. If you can pick a day with clear weather, that would be even better. The cable car ride takes about 20 minutes. Pagoda hiding in the fog. Looks mysterious. The summit marker for the tallest mountain in Vietnam. 3,143 meters or 10,312 feet.